The little red barn creaked awake. Piglet's squeal, and Bossy Cow's moo. 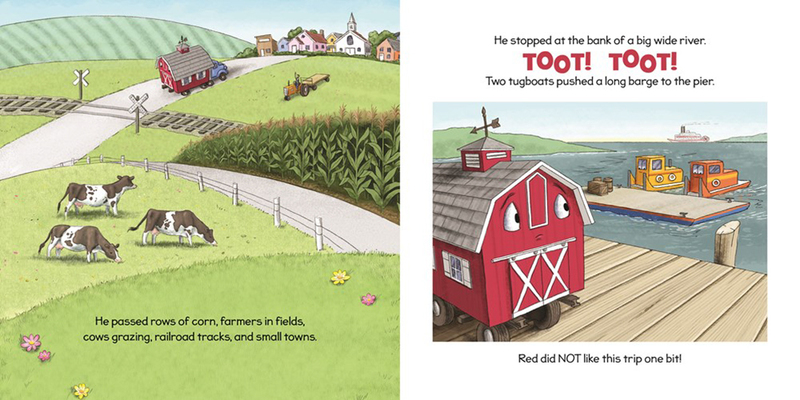 Brief Synopsis: From the publisher: When Little Red Barn wakes one morning, he finds hi animal friends have gone. He's empty and alone. And then big noisy machines lift him up and put him on a truck. As Little Red is transported across the countryside, down a major river, and through city streets, he feels anxious and a little afraid Where is he going? who will be there when he reaches his destination? When Little Red does finally reach his home in a surprising location, he finds things are even better than before. The story of the little barn's relocation and adjustment to a new place will reassure and comfort young readers facing changes in their own lives. 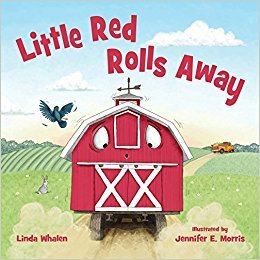 Why I Like This Book: From the beginning, little listeners and readers will be hooked by the mystery of where Little Red's friends have gone and will gladly follow sweet Little Red along on his journey. In addition to being an adventurous book with a satisfying ending (and wonderful art), Little Red offers a good example of how to cope and be open to change. I enjoyed this book on many levels and kids will too!